Over 5 days of work this month the remaining prime Romney lamb’s locks met my Forsyth Fine wool combs. Most of the more defined locks had already been combed. I hunted for the still distinct tips, and pulled away. When even those weathered tips were disorganized, I did Margaret Stove’s trick of moving the locks between fingers to find that tip grain. It took more time to load for each new pass but they were still in the tips-out orientation. As you can see from the stationary comb here only a few are showing the lock crimp. Basket full of Romney worsted singles! Each single worsted spun on my Watson Martha in scotch tension using a short forward draw with 18 lengths of hand-combed top each. Last singles shown on bobbins are 4 lengths of top each. Four plying balls = 537 g or just over 1lb. Singles all spun right with “Z” twist. I will ply for a “S” twist yarn. That right there is 18 days of varying amounts of work from Saturday, July 19th to Saturday, September 20th, 2014. I could say this was therapeutic in the month that we lost Toby. It was but what I want to tell you is that going back to the combs was difficult in such a quiet house. He used to sit at my feet (and I will show you where, down-post) while I did this work. A little piece of old knitting helped me overcome this feeling of sad silence. 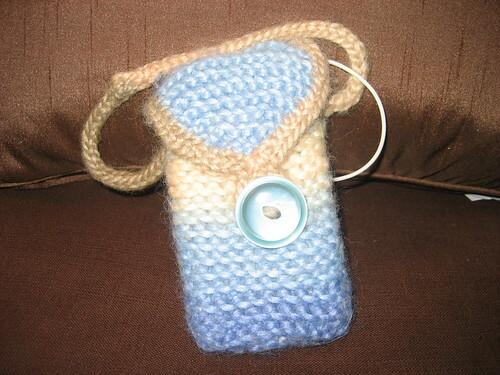 It held my phone, which played Neal Gaiman reading his “Neverwhere” (sound effects and all). It wasn’t long before I hit my stride, and got those last 6 bobbins all spun-up. Audio books, the fibre-worker’s friend. No headphone cords were harmed in the combing. The wheel is still in singles-production mode. Thoughts occur to you while a project comes together. Some are crazy pants and best not discussed too soon. For each bout of hand-combing, I separated the actual trash from what looked like seconds. Over the years, I have learned (yes, the hard way) not to be precious about this. You keep what you can keep, and the rest is compost. The cotton cards were not good for this job. I have found my standard cards with 76 tpi are giving nice rolags. It’s easy work with the hard prep work behind me. I also have un-combed locks left in another pillow-case. Best guess? The existing singles could knit up on their own into a lovely circular or Shetland-inspired blanket. What going the extra mile does is to open the door for a possible woven item. These rolags spun in the same way could make a lofty weft for example. Alternatively, I could make more worsted yarn from another fleece. At this point in my spinning career, I know that more options for sampling is optimal. 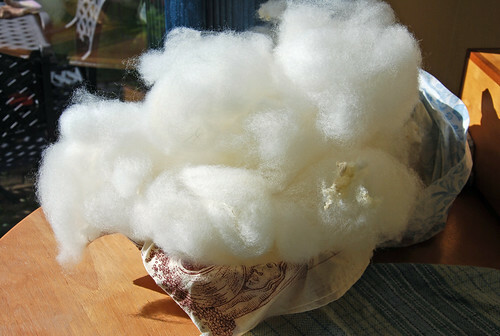 If ever there was yarn that should hit an optimal mark it is this local Romney lamb’s fleece! 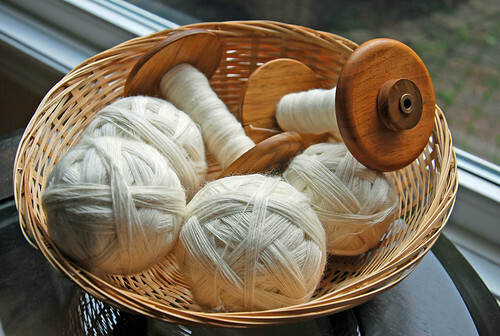 It really has been the spinning project that I hoped-for this year, and is still going strong! Thank you for everyone who has kept us in their thoughts, and who reached-out to me after my last post. Your support meant so much. I was only able to thank one of you in person but each comment was so very touching. This was Toby’s spot by my kitchen combing station. 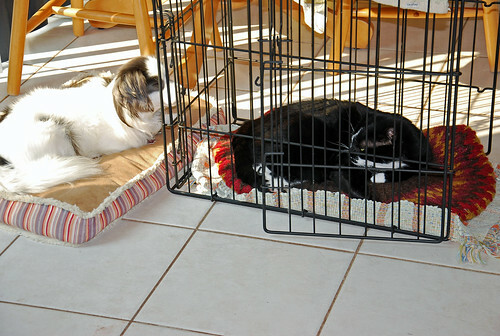 Since Melvin loved the fleece-drying rack so much last summer, we threw his bed in for the duration. They both liked it this way. N suggested another picture of Tobes for everyone here, and this is a favorite of ours. All of your comments, and replies helped me when this was still tremendously raw. Many thanks to you, friends. We are all adjusting but miss him a lot. 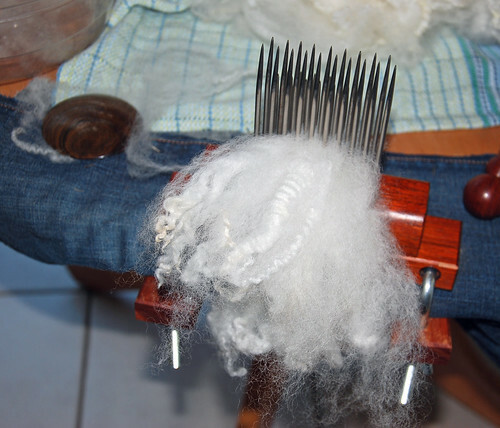 Categories: Fiber Preparation, Spinning | Tags: Equipment, Fauna, hand carding, handspun yarn, Romney wool, Watson Martha spinning wheel, wool combs | Permalink.